We are in our hotel now, going to stay some hours here because the heat outside is really unbearable. We took these photos today morning after we had breakfast near to the White Tower in Thessaloniki. What I love about this dress is its vintage feeling, although it isn't actually one. Worn with turkuaz heels, nailpolish and ring - white and turkuaz is one of my favorite summer matches, it reminds me of greek islands . What do you think about it? Lovely outfit, love the pretty hat & bag! Kai auta ta papoutsia sou einai iperoxa! Oute kserw, poses fores sto exw pei! xixi Exw kai egw se paromoio xrwma! Kala na perasete sti Thessaloniki! :) Exei ontws kauswna autes tis meres! Nice outfit!I love this colour combination it always reminds me of holidays! I definitely agree with the Greek feeling to this outfit. 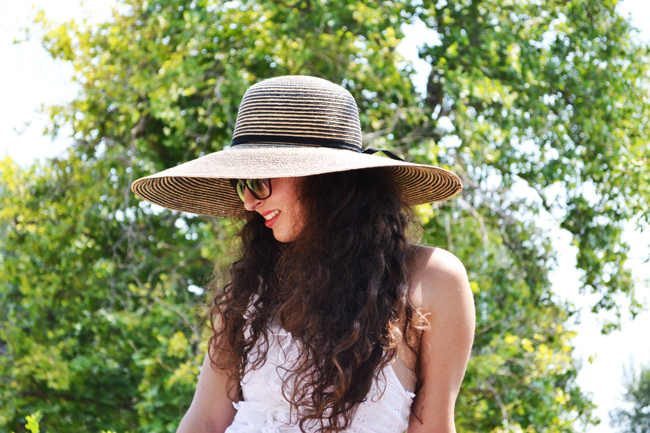 I love your big summery hat - perfect for those sunny days! Your dress is perfect for a sunny day :) you look really sweet. stunning dress + daring shoes + floppy hat = perfection. Very summery and cool. Love the turquoise heels! So chic Rania and that bag is awesome! will big hats in the summer ever go out of style? gosh i hope not. beautifully done. Gorgeous!! You look amazing! I love the dress, shoes, hat, bag... haha I love everything!!! pou eisai sto Capri? yperoxo outfit akrws kalokairi and so close to my style!